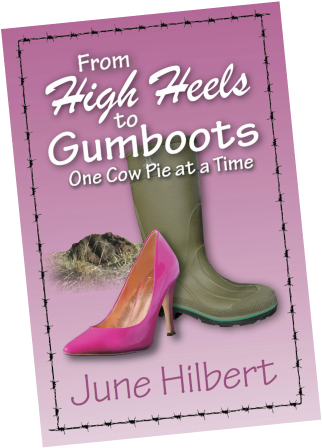 Growing up in Burlingame, Kansas, June Hilbert didn't know cow pies lurked in her future. But a broccoli bouquet after a first date soon had June saying "I do" to a man who spent his spare time herding cows on the Kansas prairie. Now this woman who spent her working life in suits knows more than she ever wanted to about calves, roosters armed with spurs of mass destruction and barbed wire fences. High heels are kicked off for gumboots so June can extradite fugitive cattle, kill snakes and even learn some (cattle) mid-wifing skills. Not only is she skilled at evading steaming cow pies, but she learned to play Cow Pie Frisbee. No longer an Administrative Assistant at a bank, June now is proud owner of more interesting titles: Bovine Fugitive Apprehension Agent, Bovine Breeding and Planned Parenthood Overseer, Certified Bovine Midwife Assistant, and General Ranch Hand. She's even the proud owner of a hay hook. Life is good on the farm, even though the shoes aren't as stylish. Occasionally, she still steps in cow pies.